When a government wants to use a media outlet to participate in a disinformation campaign, how does it go about gaining complicity of the press? It goes out and hands the story to the newspaper. In the case of the US Government, its media of choice are the New York Times and The Washington Post. The Israeli government prefers Rupert Murdoch’s outlets, like The Times of London, Fox News, and The New York Post. Let me illustrate how this works with a real-world example. The Times of London recently ran a story on how Iran’s nuclear program was gaining progress. That story was planted by the Israelis. We know this because the source was listed as “an Asian intelligence source,” which is how the Israelis are typically identified. The Asian intelligence source provided documents which the US has now come out and claimed to be forgeries. The Israelis want to push for military action against Iran. The US wants more time to negotiate. No matter what’s true or false, one can see how a state can use a media outlet to push its agenda. When the US needs to change or bolster public opinion, look for its message first in a big-time leak in the New York Times or The Washington Post. This entry was posted in US Government on 12/30/2009 by deanwebb. I just watched this video twice and cried both times. We can make differences in the world, each day in small ways, bringing more kindness and love to those around us. We can do it, and it’s worth doing. 90% of the world’s people only want to have enough to eat, a place to live, clean water, a song to sing, and someone to love. It’s the 10% that grab for power that bring evil into the world. Be the 90% that chooses life and love. This entry was posted in Reason to Live on 12/29/2009 by deanwebb. OK, so it’s actually Chinese martial arts and clogging, but “Ninja Squaredancing” makes for a better headline. Well worth seeing. Nunovo Tango is a clever little video from the Czech Republic. If you like Tim Burton, you’re going to love this macabre treat. The music is a nifty tango with great timing. Go Czech it out. GET IT? HAH! I’M HILARIOUS! Anyway, yeah… gotta see this one. I’ve been explaining to my Economics students that imports are normally deducted from GDP, as they are actually cases of our nation spending money in another country to increase their total output. Now I read that the US Government has not been deducting all imports in its calculations. All that offshoring work? It’s not deducted from the price of the final good, which could be a computer repair bill, an x-ray evaluation, or a tax preparation. That means the productivity of another nation has been snuck into our own data. Goods that have been assembled here from parts produced in other countries also haven’t had the prices of those imports deducted, so that’s another fudge that makes our GDP and productivity look much larger than it actually is. This means that increases in GDP may be illusory: they could just be indicative of more offshoring and importing rather than actual increases in productivity at home. The next time a reporter has a gee-whiz story about GDP increasing, take some time to see where those numbers came from. This entry was posted in Economics on 12/14/2009 by deanwebb. I first met Pam in AP English IV, senior year. She sat next to me and I really had a great time talking with her. We’ve talked a little over the years, but finding each other again on Facebook was really nice. Since I’m happy to do portraits of my friends and friends of friends, I was happy to take her request. Hope you like it, Pam! This entry was posted in Pictures on 12/06/2009 by deanwebb. So people ask me, “hey, can you draw me?” and I say “sure” and they say, “OK, here’s a picture of me” and then I draw it and then post it because it’s something I really liked doing and had fun with. You want a picture, too? Let me know. Marxist economists haven’t died and become part of the fossil record. They’ve adapted and continue to raise critical questions of both Keynesian and Classical economic viewpoints. I recently saw one such viewpoint on LinkTV and felt moved to comment on it. 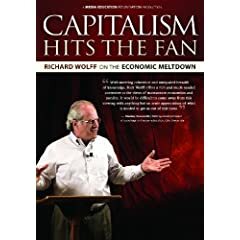 The lecture in question is called “Capitalism Hits the Fan.” In it, Economics professor Richard Wolff examines what he considers the roots of the current economic mess. He points at how regulations designed to rein in businesses quickly became rules for those businesses to circumvent, get exceptions to, and then eventually abolish. This is true. The Chinese philosopher Zhuang Zi observed as much over 2000 years ago: if rats can learn to avoid traps in the kitchen, how much more so can scoundrels learn to avoid the snares set by the law? When those regulations went away, corporate profits soared while wages stayed flat. For the last 30 years, wages stayed the same for workers across America as their productivity soared. That explains why the profits also soared. Corporations took those huge profits and then used them to underwrite consumer credit cards. Massive credit spending made up for the lack of wage increases. This entry was posted in Economics, US Government on 12/06/2009 by deanwebb. If you read the whole Bureau of Labor Statistics report, this change to 10% is no cause for celebration. Unemployment stretches are getting longer: the number of people unemployed for 27 weeks or more has gone up to 38% of all unemployed, for instance. The number of discouraged workers also increased. Discouraged workers are not counted as unemployed because they’re not in the labor force. They still don’t have jobs and they still face all the terrors of unemployment, they’re just not counted as unemployed because they’re not actively looking for work. So, yes, unemployment went down. But, no, the number of people with jobs did not increase. My condolences to the jobless. It’s not your fault. This entry was posted in Economics on 12/06/2009 by deanwebb.